In addition to the internal energy (U), another form of energy exists that is important in understanding energy transfer systems. This form of energy is called P-V energy because it arises from the pressure (P) and the volume (V) of a fluid. It is numerically equal to PV, the product of pressure and volume. Because energy is defined as the capacity of a system to perform work, a system where pressure and volume are permitted to expand performs work on its surroundings. Therefore, a fluid under pressure has the capacity to perform work. In engineering applications, the units of P-V energy, also called flow energy, are the units of pressure times volume (pounds-force per square foot times cubic feet), which equals foot-pounds force (ft-lbf). The specific P-V energy of a substance is the P-V energy per unit mass. 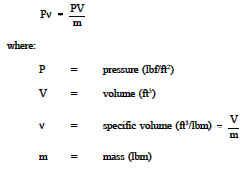 It equals the total P-V divided by the total mass m, or the product of the pressure P and the specific volume ν, and is written as Pν. Determine the specific P-V energy of 15 lbm of steam at 1000 psi in an 18 ft3 tank.